Lummi tribal members, hauling a "healing totem," are driving the route that coal trains would travel. Jewell Praying Wolf James’ story begins at daybreak and with a song. He was driving when he heard it. As he turned a corner, the song got louder and louder. That’s when he saw a porcupine dying on the side of the road. The song, James says, was coming from him. At Riverfront Park last Friday, James speaks to an assembly of local tribal members, activists and media. He’s forceful and emphatic. He’s not using the microphone, but he wants everyone at the park to hear. “Our elders told us the trees sing, everything sings a song if you only listened,” he says. “But we’re so busy living, we can’t hear our mother’s heart beating anymore and that’s what the song is, our mother’s heartbeat. When we fail to sing the songs of the earth, we’ve given up on the earth. James is an artist, activist and leader of his tribe’s House of Tears Carvers. 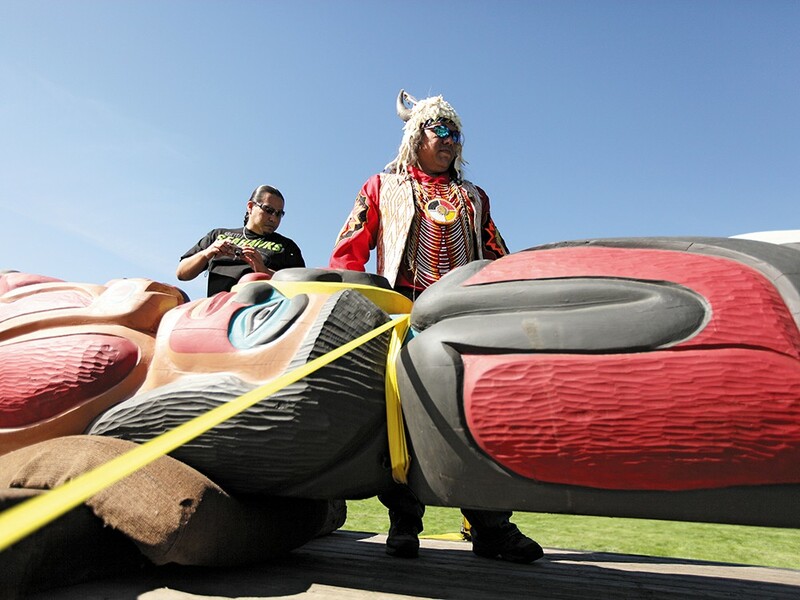 He and other members of the Lummi Tribe arrived in Spokane last Friday, carrying a 22-foot-long, 1,800-pound totem pole on the back of a boom truck. James spent three months carving this totem from a 300-year-old Western red cedar from the Mt. Baker-Snoqualmie National Forest. He has designed “healing totems” like this one in the past; he sculpted three 15-foot totems in honor of the victims of Sept. 11. Those sit in the Sterling Forest, northwest of New York City; in Shanksville, Pa.; and at the Pentagon in Arlington, Va. But this totem pole symbolizes a different kind of hope and healing. It stands for the tribe’s opposition to a series of massive coal development projects planned in the Pacific Northwest. James and other Lummi members are driving the route where the trains would transport coal from the Powder River Basin in Montana to Cherry Point on the Puget Sound — their homeland — where big coal companies and investors are planning to build the largest coal export terminal in North America. Cherry Point, north of Bellingham, Wash., is Xwe’chi’eXen is in the tribe’s language. The Lummi Nation’s heritage there dates back thousands of years. The grounds are sacred. It’s where their ancestors are buried. If the coal port at Cherry Point is approved, the tribe says it would interfere with their treaty rights, impugn their spiritual values and contaminate the Salish Sea, a rich source of salmon and shellfish. The tribe maintains the largest native fishing fleet in the U.S., with more than 450 boats employing 1,000 tribal members. If the export terminal promises to bring jobs, what will it do to theirs once the coal pollutes their waters? State and federal officials are conducting environmental impact studies of the proposed coal projects. The Washington Department of Ecology estimates that at full capacity, the $664 million Gateway Pacific Terminal at Cherry Point would export up to 48 million tons of coal per year, destined for China and other Asian countries. Eighteen train trips would cross Washington per day. The Lummi members began their journey last Wednesday with the Northern Cheyenne Tribe at Otter Creek in Montana, the site of a recently proposed coal strip mine, where one company plans to extract and burn more than a billion tons of coal. After Spokane, they travelled to Toppenish, Wash., to meet with hundreds of members of Yakama Nation at Legends Casino for prayers and blessings. Their trip ends Sunday in British Columbia, where the totem will be given to the people of Tsleil-Waututh Nation as a symbol of their solidarity in opposition to the Keystone XL pipeline. Before the crowd, James continues his impassioned speech. He encourages his audience to join the Lummi Tribe in taking a stand against coal.